To catch a flight at LaGuardia during the Christmas holidays I could do one of two things: either grab a cab and cough up well over $40.00 OR jump on an M60 bus and pay a sweet little $2.25. I had already taken the M60 from FROM LaGuardia to New York City when time wasn’t a factor and there was no plane to catch at the other end. But getting out of the city at holiday time can be a dicey proposition. With masses of travelers on the move and roads packed with drivers with short tempers, a traffic snarl could easily morph into a highway nightmare that could mean a missed flight. And with Christmas flights fully booked, there would be no hopping on the next flight out. So to maximize my chances of getting to LaGuardia on time, I left my apartment on Sunday morning at 9:00 am, three whole hours before flight takeoff. 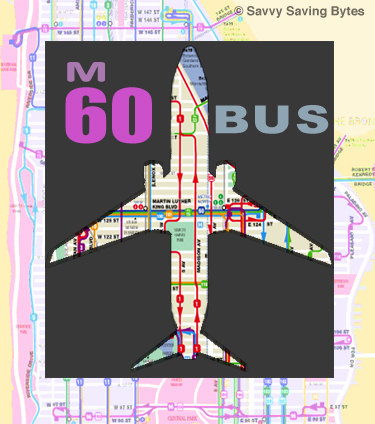 My plan: Take a Madison Ave bus from 83rd Street to 125th Street, where I’d catch the M60 (map route here). After a cold 20 minutes wait for the uptown bus, I hit my first snafu when the driver informed me his bus didn’t go to 125th Street. But not to worry, he said, I could catch the M60 on Broadway over on his West Side route. Not good – this would be traveling west when I wanted to go east but I had no time to fool around and check other uptown bus routes. I’m not sure how long it took because I was too busy searching for an M60 Bus stop, but the west side blocks seem to stretch on forever by the time I pulled my book bag suitcase off the bus at Broadway and 117 Street. The entrance to Columbia University was only yards away, nicely convenient for students already congregated at the m60 bus stop with their luggage. As the minutes ticked by more students appeared with more suitcases, including a long weirdly shaped green canvas bag that could have doubled as a body bag for skinny corpses. Another standout was a large blazing orange case made of some rigid material shiny as ice. Around 9:45 an M60 appeared (bus schedule here) and we all clamored aboard. It was one of the new city buses, double long, but just as narrow as the old ones. Which meant by the time we were all seated, suitcases of every size and shape littered the center aisle. With each new stop, more suitcases were added to the obstacle course. For boarding passengers dragging on ever more suitcases, it was like snaking their way through a minefield. And for the numerous standees wedged between suitcases, it was a major challenge trying to maintain their balance while not knocking over luggage or bashing into other passengers. Because the traffic was Sunday morning light, we pretty much sailed from west to east on 125th Street. The sparse highway traffic in Queens behaved too. Our first stop at LaGuardia turned out to be on the unfamiliar looking lower level, an area where passengers usually depart from the airport rather than arrive. Anxiously awaiting us, a crunch of travelers surged forward and begged the driver to let them re-board. Apparently they had gotten off at the wrong stop on a prior M60. Not surprising, since the driver neglected to announce which airlines were at that particular terminal. New to LaGuardia, the discombobulated passengers had probably assumed the first stop encompassed the whole airport. To avoid a similar fate I jumped up and asked the driver which terminal housed my departing US Air flight. I had two more stops to go, he said. To add some additional nail-biting tone to the day, US Air was renovating their space in the terminal and instead of two separate interior lines – one for check in and one for security, both lines had been combined into one VERY long, VERY slow-moving line. Somewhere along the snail-creeping trail I lost track of time. When finally I cleared security and headed for my gate, I had exactly thirty-five minutes till flight time. Just enough time to search for a yogurt in the jammed food court, gulp it down and rush to my gate where as usual a multitude of Christmas stand-byes were waiting to jump into any unclaimed seats. Lesson learned: Allowing three hours door to door to LaGuardia on the M60 was adequate if the traffic was light. But with busier traffic, giving yourself more time could be a gift to your blood pressure. Could a Cheap Plane Seat Save Your Life? Airport food can be outrageously expensive; I had an insanely pricey breakfast once at LaGuardia (thanks Dad; if I had known ahead of time I would have grabbed a donut or something on the way out the door and skipped the airport food). Too true! I paid far more for that tiny yogurt than I pay for a huge 32 oz size. Unfortunately, taking food from home through security is a lot tougher these days. What a stressful story! I am glad you made your plane but this doesn’t sound very encouraging for the next flight. Will you try it again or will you take a cab? It’s funny, your story reminds of when I was in college and took a Greyhound bus from Albany to Manhattan to meet my friend Rich in NYC. The driver was new to Greyhound. Actually it was his first official trip as a Greyhound driver. I think he was from Haiti. Anyway, when he got to Manhattan he freaked out! The traffic was too much for him and he had no idea where the Port Authority was. So I stood up and offered to guide him. We sailed down Broadway, no problem. When we got to the Port Authority the whole bus broke out clapping! That story about the Greyhound driver freaking out is hilarious. If not for your guidance you guys could have landed up in Hoboken. Actually I had a similar situation. When I first moved to the city a friend loaned me his car for a few days while he was out of town. I dropped him off at the airport, drove into the city and was so unnerved by the crazy traffic and even crazier drivers, I took his car and returned it to his garage the next morning. Give me a bike any day. And yes, I’ll take the M60 again. Weird as it may sound, I welcome situations like that as a way to keep from going too American soft. Love your M60 spirit, but this point I’m too American soft! I’d take the cab :).